The Atlas 3 is easy to set up and simple to use. 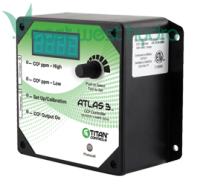 It controls and monitors CO2 from 0 to 2000 parts per million (PPM) and offers CO2 enrichment or CO2 exhaust features. Plastic enclosure resists dust and moisture. Another innovative product brought to you by Titan Controls! 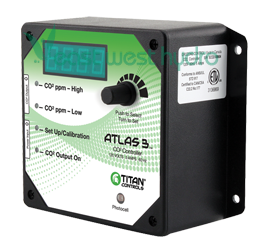 Controls and monitors CO2 from 0 to 2000 parts per million (PPM). CO2 enrichment or CO2 exhaust features. ETL listed product to UL standard 917. Easy to set-up and operate. Dimensions: 5.5in. × 10.8in. × 4.1in.